Marines were hit with a false, damning narrative because they dared to challenge harmful feminist ideology. 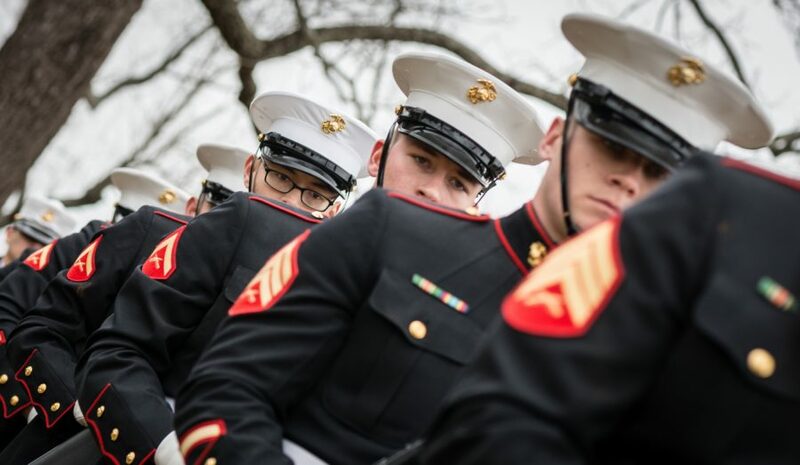 March 16, 2014: Members of the U.S. Marines Ceremonial Honor Guard prepare for a 21-gun salute at James Madison´s Montpellier family Cemetery. In early March, Thomas J. Brenner broke the story: “Hundreds of Marines investigated for sharing photos of naked colleagues.” In a force of more 181,000 Marines, the number of participants is miniscule: .0046%. Yet feminists are pushing a damaging false narrative: that this crass behavior is typical of male Marines. In fact, such disgraceful actions run contrary to standards of conduct and leadership that we Marines learn from boot camp on. Back in the 1990s, Senator Pat Schroeder used the Tailhook scandal to push combat pilot jobs for women. The Navy’s annual celebration was notoriously debauched with men and women participating equally, until sexual assault occurred. The year of the scandal two women were assaulted but the number was grossly exaggerated. A witch hunt ensued for the sake of the same “masculinist culture” purge. Thousands were punished for the actions of a few — even men who weren’t there and had nothing to do with the event. Schroeder said opening the pilot jobs would stop scandals like Tailhook and give women the respect they deserve. The fact that it didn’t work just means there’s (perpetually) more work to be done. Right on! This is a great piece! Agree %500! You know what other crass behavior is typical of male Marines? Protecting the freedoms of feminists to run their diseased mouths off. Great piece Jude! #MOAT Mother of all TRUTHS…..Sierra Hotel Marine and thanks for illuminating what the feminist teapot truly represents. At a terrible time, in a terrible way, we will have our noses rubbed in what a terrible idea opening combat MOS to women is. After the Marines I joined the Army National Guard. I was absolutely shocked at how poorly trained and poorly disciplined the young soldiers just out of training were – particularly our Radio Operators who were co-ed trained all the way through boot camp and MOS school. They couldn’t march or shoot, were in mediocre physical condition, and generally acted like civilians in uniform. They didn’t much care for working for me. That’s what they want to turn the Marine Corps into. Jude, I really like your style. Women have got to stop being their own worst enemy and start using their heads. Liberal “feminism” (which isn’t really feminism at all) is such a vile poison. Right on-target, Jude. My experiences were identical to yours. Thank you for speaking the truth, and for speaking it so eloquently and factually. Ooh Rah! Amazingly well-written, right on the mark. Semper Fi.